Nonetheless, he is one of my favorite Cincinnati politicians of all time – mainly because we shared a passion for the Cincinnati Reds. And fishing, too. Charlie Taft loved fishing. He used to be seen driving his car around town with a canoe strapped to the top. On the back of his tombstone at Spring Grove Cemetery is the image of a man with a fishing pole and the inscription Gone Fishing. A love of fishing and a passion for the Reds binds Charlie Taft and me together. He had the most interesting life – the son of President William Howard Taft, young Charlie went to live in the White House when he was 11 years old. He dropped out of Yale to serve in the Army in World War I. After the war, he earned his law degree from Yale Law School. Charlie and his brother, Robert A. Taft, later a U.S. Senator who was known as "Mr. Republican," helped found the law firm of Taft, Stettinius & Hollister in the 1920s, still a powerful law firm today. But his biggest contribution to Cincinnati politics came in 1925 as one of the original members of the Charter Committee, formed to rid the city of the corruption and incompetence of a Republican boss system and replace it with a council-manager form of government. 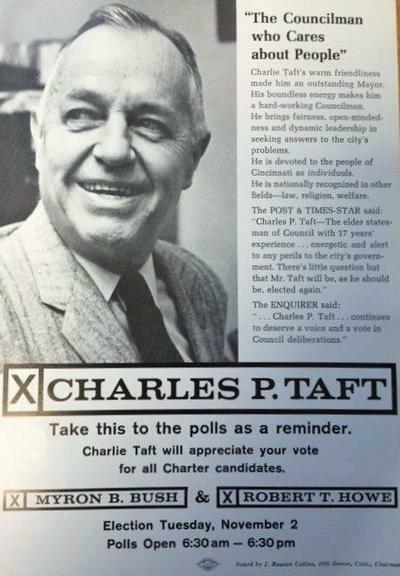 They succeeded; and Charlie Taft ended up serving nearly 30 years on city council as a Charterite – from 1938 to 1942, from 1948 to 1951 and from 1955 until 1977. From 1955 to 1957, he served as mayor and was known around town as Mr. Cincinnati. You would be hard-pressed to find an individual who had more influence than Charlie Taft. Back in the late 1960s, when city leaders were planning and executing the construction of Riverfront Stadium – a step deemed necessary if the city was to keep Charlie's beloved Redlegs in Cincinnati – it was suggested that the new ball park be named after him: Charles P. Taft Stadium. Charlie Taft was not a man who needed his ego fed; and he made it clear that, whatever the new ball park would be called, it would not be named after him. How much did Charlie Taft love the Reds? 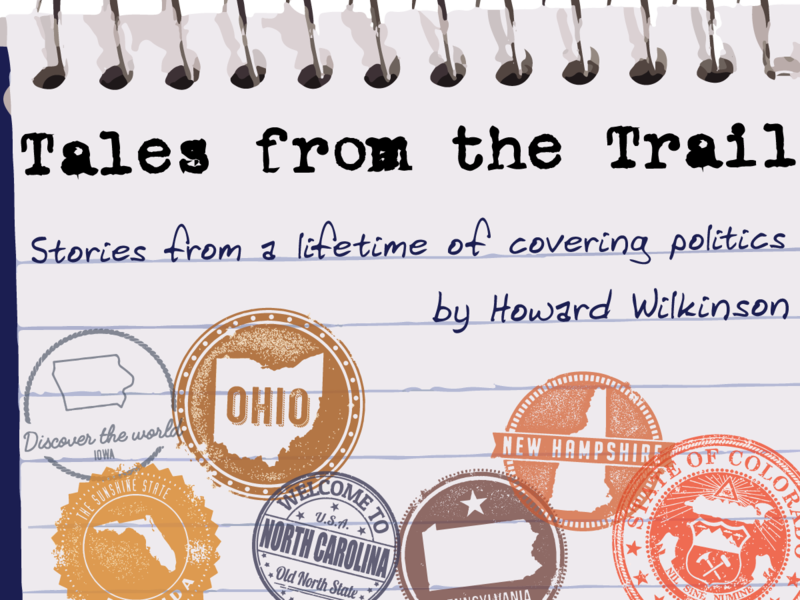 It was not uncommon for Charlie, when the Reds were playing an afternoon game, to sit at his desk in council chambers with a transistor radio and an earplug listening to the games. Reds 5, Dodgers 1, middle of the third……Garvey just hit a solo home run for the Dodgers…..5-2, Reds. This was a regular thing at city council meetings during baseball season. Charlie Taft was long gone by the time the Reds reached the National League Championship Series in 1990, facing the Pittsburgh Pirates for the right to move on to the World Series – which the Reds most certainly did; the "Wire-to-Wire" Reds went on to sweep the Oakland A's in four games. I wasn't the regular city hall reporter; I covered politics, but I would fill in over there from time to time. I was sent over one afternoon for what appeared to be an extremely boring committee meeting that was happening at the same time the Reds were facing the Pirates in a play-off game at Three Rivers Stadium. Call me unprofessional. Call me whatever you like. But I took along a transistor radio with an earplug. And I sat in council chambers listening to Marty and Joe in one ear and this excruciatingly boring council committee meeting in the other. Every council member in the room knew what I was doing; my reputation as a crazed Reds fan had preceded me. They could read my signs – a slap on the table and a Yes! for each Reds' run scored; a scowl and a groan every time a Reds pitcher gave up a run. The meeting was grinding on and on. At one point, then-council member Bobbie Sterne – a good friend of Charlie Taft – got up to walk out. As she passed by me, she stopped and smiled, and patted me on the arm. She pointed to my ear plug. It's just like having Charlie Taft back again, she said. It was the nicest thing any elected official has ever said to me. Or ever will, I imagine.